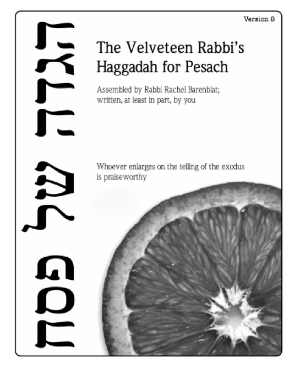 If you’re looking for a free downloadable haggadah which tells the story of the Exodus with traditional texts alongside creative interpretations; offers classical material alongside contemporary poetry; honors new traditions as well as old ones; and interweaves song, story, prayer, and opportunity for community participation; you might dig the Velveteen Rabbi’s Haggadah for Pesach. It’s been four years since the most recent full version (version 7.1) was released; the latest edition is version 8, which features clearer page design, a wealth of new poems and teachings, and more. Read all about it at the Velveteen Rabbi blog; the haggadah can be downloaded from there, or from the haggadah page at VelveteenRabbi.com. Posted in Passover, ReSources. Bookmark the permalink.